Have You Lost Focus on Your 2019 Fitness Goals? Making a New Year’s resolution is a great way to form new habits, reach a goal, or adopt a healthier, more productive way of living. Many of us resolve in January to lose weight, eat healthier and exercise more, but according to U.S. News, approximately 80% of resolutions fail by the second week of February. So if you’ve lost your steam or focus since the New Year began, you are definitely not alone. As a member of Edwards Communities, you have access to an incredible fitness center at your community, and/or the beautiful 5,500 square foot fitness space at The Barn. Steve Flowers has been the fitness instructor and personal trainer at The Barn since 2014. He has a degree from The Ohio State University, a personal training degree from National Academy of Sports Medicine, and a Bootcamp/HIIT certification from MetaFit. He says that many factors can play into losing focus on your New Year’s fitness goals, such as your job, family, lack of support, or setting unattainable goals for yourself. He advises his clients to make shorter, realistic weekly and monthly goals. An example of a weekly goal is going to the gym three times and attending one class. An example of a monthly goal is losing seven pounds, attending five fitness classes and modifying your diet. Steve is a valuable resource, willing to help any of our members with their fitness goals. 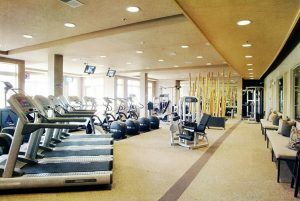 The Barn’s fitness center has over 20 pieces of cardio equipment such as treadmills, elliptical/cross trainers, recumbent bikes, upright bikes, and a stepmill. Plenty of hand weights, a power rack, full-circuit weight training machines and a spacious stretching area lends plenty of options to members no matter what fitness level they are at. Our members can work on strength training or cardio training, attend group fitness classes or schedule a personal training session. The Barn’s fitness center hours are Monday through Thursday from 6 a.m. – 9 p.m.; Friday from 6 a.m. – 8 p.m.; and Saturday and Sunday from 8 a.m. – 4 p.m.
It’s not too late to regain focus and achieve your fitness goals for 2019! And you don’t have to do it alone. For more information or to schedule a personal training session, contact The Barn at 614-527-7800 ext. 107.